We support blind and partially sighted children and young people from birth to 25 years, their families and carers, and the professionals who support them. Please note, the way sight loss is registered in Scotland is changing. As of 1 April 2018, the Scottish Government introduced the new Certificate of Vision Impairment (CVI) Scotland form. This replaces the BP1 form. However, the CVI form does not include children and young people under the age of 16 years. Instead, arrangements for supporting them will follow the Visual Impairment Network for Children and Young People (VINCYP) Pathway (a clear pathway to access specialist assessments and support). Information and advice to parents and carers, supporting them with regards to education, health and social work. 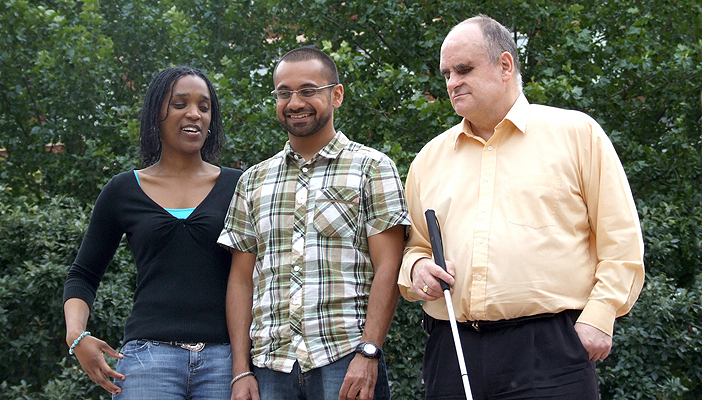 Information about the registration process for registering sight loss. The process has recently changed in Scotland, download the Scotland Registration Changes document (Word, 15KB) to find out more. Family fun days, summer camps, out-of-school activities, residential weekends and other social events. Advocating on behalf of children, young people and their families at local authority, national and government level. Training for teachers, parents, health and social work professionals and other relevant organisations. Our IRISS project offers support across Scotland to children and young people living with sight conditions from birth to 18 years. Specialised support for families of young children from birth to five years through our Best Start project which includes Haggeye Tots. Haggeye, our youth engagement forum for blind and partially sighted young people aged 12 – 25 years in Scotland. Our friendly and supportive forum helps young people to raise awareness of what it’s like to be blind or partially sighted. Haggeye Jnrs is for children aged 5-12 years with vision impairment and their families. This includes activities, events and the quarterly ‘Haggeye Jnr and friends’ magazine. Haggeye Tots provides an opportunity for families of children from birth to five years to seek peer support and take part in events and fun activities. Trying out technology - our Technology Education Loan Library (TELL) initiative offers a range of aids and equipments to help blind and partially sighted school pupils in Scotland. Schools can borrow these free of charge for up to six weeks. For further information, ‘Our Services for Children and Young People’ booklet is available online on our Reports and Publications page. This booklet is also available in audio and braille formats. Our comprehensive guide for the parents of children and young people with sight loss, 'Sharing Your Journey', is also available on our Reports and Publications page. Both publications are available in audio and braille as well as hard copy. Visit our main Children, young people and families section for details of UK-wide information, products and services.